1. 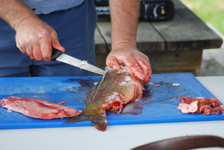 Place the carp on a clean filleting board and hold firmly with one hand. 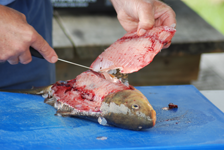 Take a sharp filleting knife and make a slice from the top to the bottom of the carp at the front of the rib cage and behind the gills. 2. 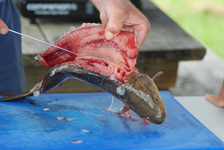 Place the point of the knife at the top of the slice behind the head and slice along the back bone from the head to the tail. The rib bones are usually too strong to cut through. 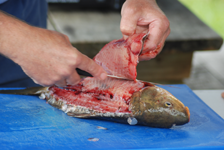 the knife over the rib cage until you get to the bottom of the stomach cavity. 4. 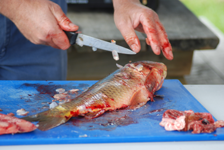 Run the knife to the tail to cut the fillet clear of the Carp. 5. 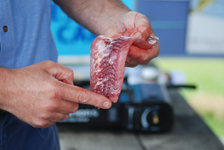 Place the fillet on the board with the skin side down. 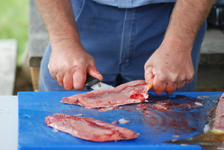 Hold the fillet by the tail and cut through the flesh near your fingers until you reach the skin. 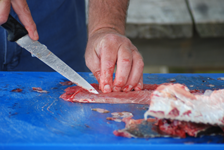 Lay the knife parallel with the fillet and draw the knife away from your hand slicing the flesh from the skin. 6. 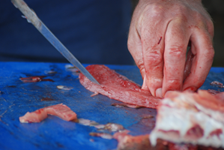 Place the flesh onto the board with the skin side down and then cut away the white section of fillet that was covering the rib cage. 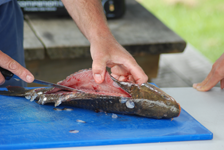 Avoid any red flesh at the top and any bones near the tail end of the fillet. 7. 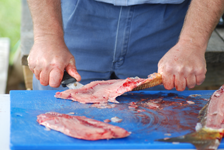 You can also cut away a narrow piece of boneless flesh from the shoulder of the fillet. 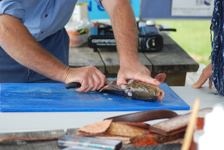 Cut into the fillet approx 15mm and 50mm from the front and then stop approx 50mm from the tail. If you go too far you will feel the bones, so just with draw the knife a small amount and then continue. Don’t forget to put the centre bit back on the ice or in the fridge and take it home to feed a cat or two.